Julie & Julia, directed by Nora Ephron, is decidedly more a movie for women than men, but anyone who thrills to watching the genius Meryl Streep at work will want to settle in with this one on a rainy night. It's one of those films you can return to again and again as a true feel-good film. As with every role Streep plays, she completely embodies the character, in this instance the irrepressible Julia Child, famous television chef and cookbook author. It is incredibly fun to watch Streep having fun while her character Julia is having fun, which the famous chef seems to do nearly all of the time as a result of her pure joie de vivre. 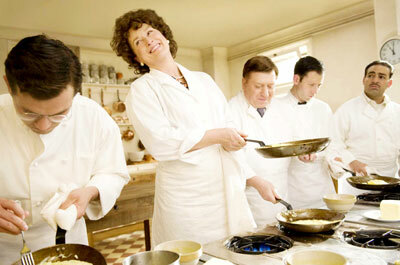 Julia Child's lust for life, especially in the form of food, is contagious. More than anything, this is a movie for people who love to eat, love to cook, or would love to be able to cook. One cannot say as much for the somewhat whiny Julie Powell, the frustrated writer, played by Amy Adams who, in the year 2002, blogs about her attempts to cook all 524 of the dishes from Julia Child's Mastering the Art of French Cooking, over the course of 365 days. (Powell's memoir was released in 2005.) The film bounces back and forth from the past to the near-present. And while Julia's life is much more engaging than Julie's, watching the younger woman's day-to-day frustration keeps the viewer a bit grounded in reality, lest one gets too wrapped up in the fantastical life of Julia Child's 1950s France. It's not that Julia Child had a trouble-free career as cooking student, teacher and author. It's just that in spite of her disappointments and downfalls, she maintained incredible courage and good humour. Also gratifying to watch is the portrayal of her marriage to Paul Child, played with irresistible sweetness and charm by Stanley Tucci. It's a relationship that any modern married couple might aspire to. More than anything, this is a movie for people who love to eat, love to cook, or would love to be able to cook. It's also a film for those who simply love to bask in some wonderful performances. Julie & Julia may not be a life-changing cinematic experience, but for many food and feel-good film fans it will become one of those comfort movies that they might curl up on the couch with bowl of macaroni and cheese on hand. It may not be Julia's Boeuf Bourguignon but one can always fantasize.